A few years after graduating college, my roommate Greg and I would sometimes plan to go out to eat with a variety of friends. As we would call people and see who was available, we had a saying that we would repeat to one another: “Yes means maybe, and maybe means no.” That is, people would rarely commit wholeheartedly right away. Usually people would have to “check their schedule” or try and see “what else was going on” before they would take Greg and I up on our invitation. In the time of Jesus, the Rabbis had elaborate traditions for the regulations of oaths, vows, and the penalties associated with breaking them. But as New Testament Scholar A.M. Hunter put it, “Oaths arise because men are so often liars.” If the reason you are taking a particular oath in a certain way is to avoid keeping your word, then you have already exposed your own deceit. Oaths are not completely prohibited by Jesus (He himself responded under oath when questioned by the high priest in Matthew 26:63 ), but we should not need to “swear by” anything in order to tell the truth and keep our word. Jesus said let your “yes be yes”. Literally in the Greek text of Matthew 5:37 it reads, “But let your word be yes, yes; no, no.” Meaning, in order to keep your word you should not have to add qualifiers, preamble or resort to an oath. We don’t need to stand behind religious language in order to keep our word. 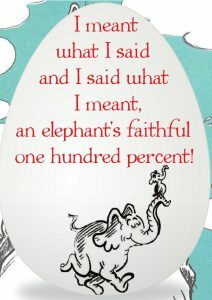 We appreciate when people say what they mean and mean what they say- Horton the Elephant is a model for us all!